Now there’s nothing left for Gun Runner to prove. Named Horse of the Year this week, he experienced a finale fit for champion while winning Saturday’s $16 million Pegasus World Cup at Gulfstream Park, overcoming an outside post position, a short run up to the first turn and the classiest field he’s ever matched up against. That’s what we’ve come to expect from the son of Candy Ride, who’s off to stud at after a fifth straight Grade 1 victory to close his career. "His last race and everything he's done for us, for him to come through like he did today -- overcome the draw -- I'm just so proud of the horse," said trainer Steve Asmussen. "What a dream come true he is." Much was made of Gun Runner's No. 10 post position, given how much of himself he may need to use establishing early position. But the 5-year-old broke alertly and had just one rival ahead of him entering the clubhouse turn. "He got to that first turn," and it was then, said Ron Winchell, who campaigns the horse with Three Chimneys Farm, "my concerns left." In a Breeders' Cup Classic rematch, Collected, that race's runner-up, set the opening fractions of 23.41 for the opening quarter mile and got the half in 46.61. But Gun Runner stalked every step of the way up the back stretch. Entering the far turn, he poked a nose in front and never trailed from there. A second entry trained by Bob Baffert, West Coast rallied for second but was no match as Gun Runner completed 1 1/8 miles in 1:47.41 under jockey Florent Geroux. The winning margin was 2 1/2 lengths. Then it was well back to Gunnevera, who edged Fear The Cowboy for third in the field of 12. In its second year, the Pegasus is the world’s richest Thoroughbred race, its purse increased from the inaugural running when Arrogate took the winner’s share of a $12 million prize. 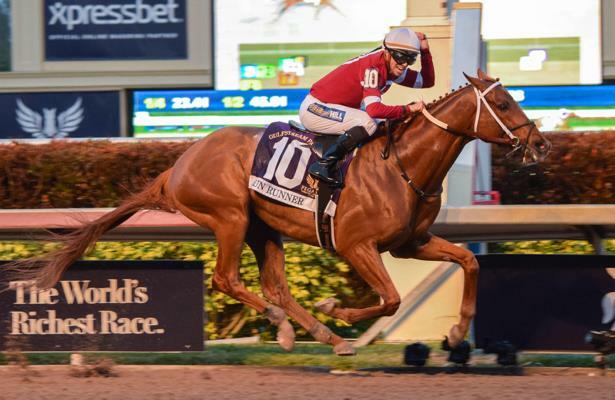 Gun Runner added $7 million in earnings to the $8.8 with which he entered Saturday's race. The champ will retire with a record of 12-3-9 in his 19 starts. "His memory will be with us forever -- to be able to share with my family and a wonderful ownership group," Asmussen said. "What a special horse."